Bring comfort and style together with this modern high back look of leather executive Carriagewood desk chair. BIFMA certified for home or commercial use, this elegant black executive chair is supremely cushioned and curved to support your back and head, accented with rounded sleek silver armrests. The thick swivel seat conveniently adjusts to your desired height with a lever, along with a tilt back lock-in mechanism. The sturdy silver metal base with five capped nylon castors, smoothly glides across the floor for easy mobility. 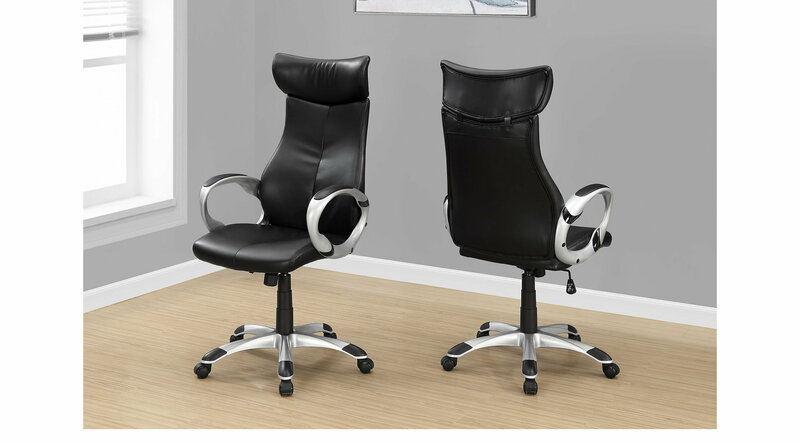 This easy to assemble trendy executive office chair gives a rich look to any office or gaming space.